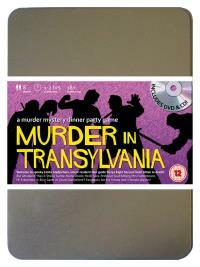 You've been invited to play the role of BRIDE OF FRANKNBEANZ in Murder in Transylvania. Who killed Sonya Right? Welcome to Castle Gladjorhere, home of the world’s one and only Transvampire with a soul! Visitors from all walks of life have come to witness the thrills and chills of this genuine Transylvanian house of horror, all of which will be revealed by the resident tour guide Sonya Right. But shortly after dinner Sonya is found in her room with two small puncture wounds in her neck. Join us to find out who sucked the life out of her! His wife (she’s always in stitches!) Costume Suggestion : Stunning silver dress, lipstick and tinted hair show that you’re truly not of this world, if the numerous crude stitches don’t already make that clear. You occasionally need to jumpstart Mr Franknbeanz’s bolts with the power leads you carry with you. You were born in Russia and moved around a lot before settling in Transylvania. You’ve worked as a housekeeper at Castle Gladjorhere for two years and the Count very kindly provides you with room and board in return for keeping the Castle looking suitably spooky. You’ve been married to Mr Franknbeanz for fifteen years.